I think it is fair to make the assumption that almost everyone has seen, and perhaps even picked up a lady bug. When not flying, this beetle looks completely harmless, cute even, but when they lift their shell and show off their large, veiny wings, this creature takes on a completely different form. The Ladybug, or Ladybird as it is called in many regions of the world, is an insect belonging to the beetle family. 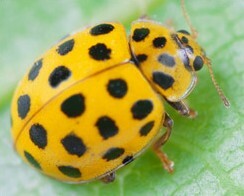 Most people can immediately recognize a ladybug by its scarlet shell with black spots, but few people know that this bug can also be yellow or even orange as well. The most interesting thing about the lady bug, however, certainly is not its appearance, but rather its ability to fly and the biology of the wings on this insect. The coccinellidae, scientific name for ladybug, has a round large protective shell on its back to cover up its flimsy, light wings while it is not flying. 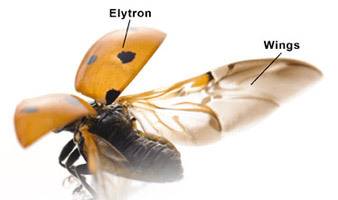 This protective shell is known as the the elytra, and are actually a set of modified forewings, which open up and remain open as the ladybug flies. These forewings, however, serve no purpose in lift or thrust, and are primarily there only to protect the hindwings. The hindwings are where the magic happens and flight is born. These wings, or alae, are four times the size of the ladybug itself and can move independently of each other. Each of these alae can move up and down, forward and backward. The alae or inter-laced with veins which the wings fold along when packed up inside of the elytra. Although these wings are different in the way they pack up and deploy, in function they are not unlike a birds wings except that the wings must beat at a must faster pace to support itself. Growing up I had always been taught to never kill a ladybug because they are good luck, plus often times they took care of it themselves by frying in my lamp. What’s interesting about the ladybug is that it loves the heat and in fact cannot even fly in temperatures below 55 degrees. They have also been known to fly great distances just to find warmth. Farmers love to see ladybugs because they consume pests that would kill their crops. Next time you see a ladybug before to treat it with respect cause it may have travelled quite a long distance to get to your warm house. How Does a Lady Bug Fly?, Chad Hunter, ehow contributor. I really want to know how those wings fold up so neatly! Nature’s origami. Really interesting post. I had no clue that their wings were as big as they were! Why is it that they need heat in order to fly, though? Maybe they need heat to unfold the wings? wow, that is specialized, and that is interesting theory on the cold temperatures, I’ll try to look into it a bit.